Today, PHM conservator Leanne tells us about her recent trip to the North American Textile Conservation Conference in San Francisco. The North American Textile Conservation Conference provides a bi-annual international and open forum for specialists working within the field of textile conservation. The 2013 conference tackled the theme: Conserving Modernity: The Articulation of Innovation. Oral presentations and research posters were full of textile conservation scenarios concerning analysis, history, and evolution of modern materials as objects and as conservation materials to innovative and experimental treatments. Delegates represented a world community and vibrant discussions ensued. I took in the rollercoaster of talks and slides covering topics such as preserving viscose rayon, assessing the dilemmas of using nylon stockings as an installation art work, modern shoes, maintaining PVC inflatable sculptures and rubberised flannel which are often used in Native American regalia. All case studies presenting different challenges, solutions and on-going issues. Research posters discussed creating invisible mounts, the conservation of plastic dolls and introducing sustainable materials to use in treatments. Of course, there was my poster displaying the issues of preserving modern painted banners representing modern working person’s history in the UK. The most interesting aspect of the conference for me was the open panel discussion entitled In the Realm of the Visible and Invisible: Concepts and Material in the Conservation of Contemporary Textile Art. The panel included conservators, teachers and a textile artist who created large open display installations. Discussions turned to the use of modern materials and the rapid effects of natural aging verses the artist’s intent and which of these elements are best preserved? Deciphering deterioration patterns and how these may be integral to the object was reported and the impact of working with both living and dead artists. I was interested to listen to a textile artist explain the importance of personal, social and political awareness in his work. Remembrance and memorial aspects of his textiles were essential elements for preservation. Jill Sterrett, Director of Collections and Conservation at San Francisco Museum of Modern Art, helped shape the conference with her keynote speech explaining conservation in contemporary times is a fine balance between the engagement of the artist, their practices and diverse materials. This is a reminder that people will remain central to this ‘business of objects’. I felt this was very relevant to the textile collection I conserve where emotional agitation and human impact is often noted. As I collected my poster at the end of the conference, one of the organizing committee commented on how beautiful my poster looked. I thought this was a strange description of my serious attempt to contribute the work of modern banner makers to the serious world of conserving modern and contemporary art. As I caught the bus back to downtown San Francisco from the de Young Museum (conference venue) at the Golden Gate Park, I thought of all the banners I have worked on. Yeah, I would agree, working man’s history is actually rather beautiful. As part of this year’s Parliament Week, the People’s History Museum are holding our very own politics festival- POLLfest- an exciting series of events all based around this year’s theme, women in democracy. Parliament Week is a government initiative which aims to inspire, engage and connect people with parliamentary democracy. Running from Friday 15 November to Thursday 21 November, PHM will hold discussions, debates, displays, comedy and much more! 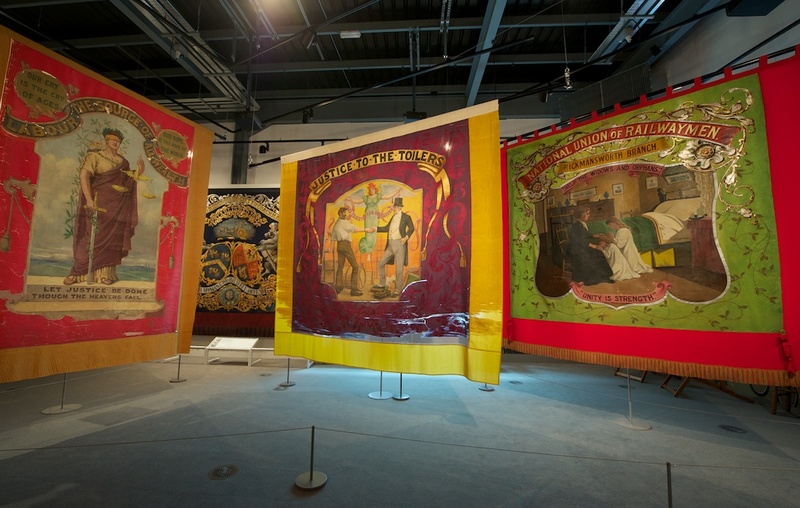 Friday 15 will see visitors come and learn more about women’s contribution to democratic life in a specialised gallery tour and those who would like to stick around will be treated to some unique material from our Labour History and Archive Centre as well as the chance to go behind the scenes in an archive tour. Booking is advised- call the museum on 01618389190 or email info@phm.org.uk. We will be holding two events on Saturday 16 November, a debate in the afternoon, and a Pecha Kucha event in the evening. The debate will look at the legacy of Margaret Thatcher, as a whole, and more specifically her legacy to women in senior political roles. We are still in the process of confirming speakers for this debate, so stay tuned for more exciting announcements! 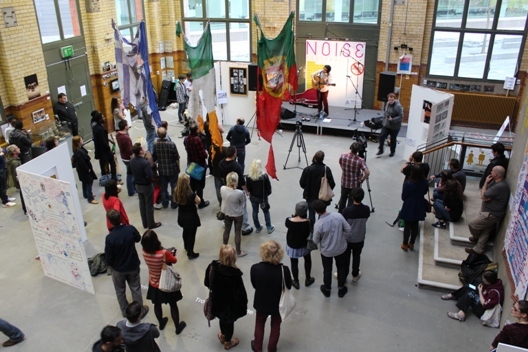 Pecha Kucha will be held from 6pm in our Engine Hall, and will feature 6 speakers talking for 20 seconds on 20 slides. Themes for the speakers will be on a whole host of topics including politics, social revolts and art. Our cafe bar will also be open for drinks, what more reason do you need to book! Tickets are free and can be claimed via Eventbrite. On Sunday 17 November, we will be hosting our very own comedy spectacular from 4pm in the museum. We will have performances from Do Not Adjust Your Stage who will provide us with improvised fun based on scenes and stories in the People’s History Museum. Stand-up comedian Grainne Maguire will headline the evening with her ‘One Hour All Night Election Special’ show. Both acts have received rave reviews from past performances, and we are very much looking forward to welcoming them to PHM! Tickets are free but donations would be gratefully received- book them via Eventbrite. Check back for more POLLfest announcements, and get booking your tickets- it’s set to be an amazing few days!